A couple years ago I painted a pair of T34 tanks for Owen's and my birthdays. 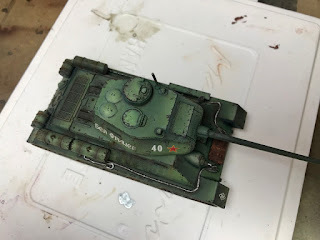 The tanks started out identical, but after picking up a Trenchworx tank for Bolt Action, and being inspired by another friend's Konflict '47 force, I figured it was time to retrieve the tank from the bottom of a box and see what I could do to update it. 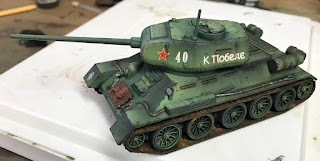 In terms of painting, the tank had a fairly solid foundation. Panel highlighting, pin washes, and color modulation all worked very well on it. However as a monotone tank, it suffered a little in the visual interest category. It also looked a bit too much like a toy. The first thing I addressed was a lack of paint chipping. 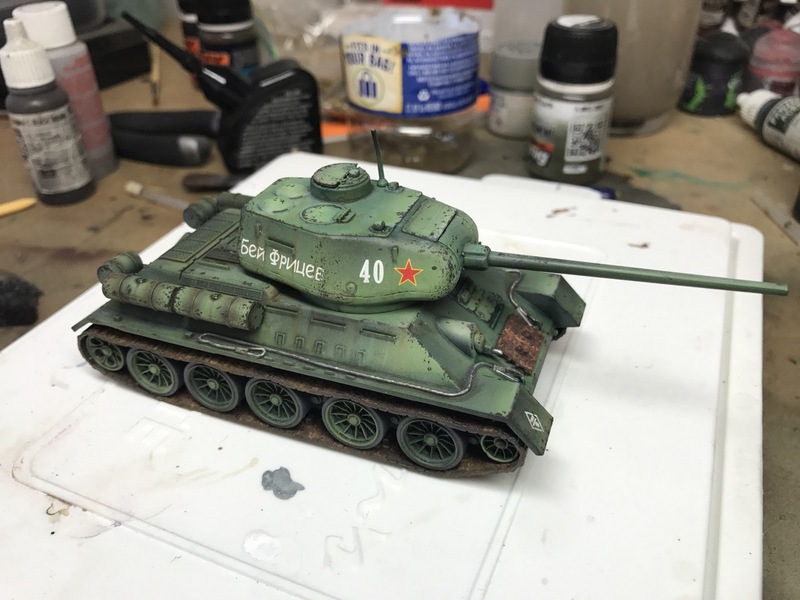 Using a sponge and a brush I was able to chip up the model in under an hour. This broke up the harsh transitions and helped tie the tank together. 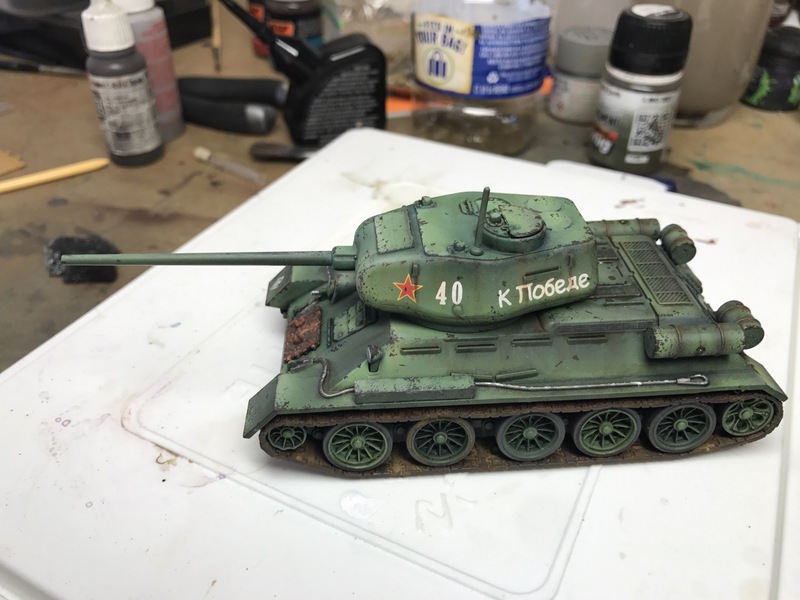 I next worked some more colors into the model. I used blue, red, grey, and buff oils and worked them into the surfaces adding different tones wherever needed. Blue was added to shadow areas, buff to highlight areas, and red and grey used to streak down the sides of the tank. I finished this process up by adding oil stains on the barrels and to either side of those vents behind the turret. 3) drill out the weapon barrels. 4) fix the turret seams using.....magic? Number 4 is where I could use some help. I'm just not sure what the right path for correcting the seams is. Should I just find a bunch of junk to glue to the turret and cover up the problem? Do I just ignore the problem? Any suggestions would help. Tried liquid greenstuff? But if you don't want to repaint, maybe some camo netting? Or tarpaulin? You could really just teach a class on how you do your vehicles John. That good! Wow, thanks Greg! I would be happy to do so. I've always wanted to do a start to finish full day event that takes a model all the way through the process. I think that would be a lot of fun. Ya, just watching your modulation last year at nova was eye opening to see how it works in practice! Maybe should get Mike to give you a class slot one of these upcoming years! What a beaut! 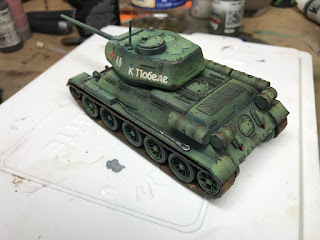 No one paints tanks like you do. Looks wonderful. I second the notion that you should do a class. 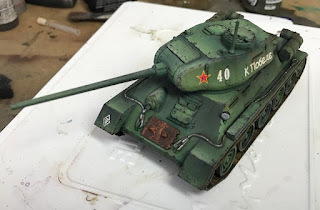 "How to Paint Tanks - the Stiening Way." Though not sure I can make NOVA this year. Thanks Tim! I try to emulate a lot of your stuff. The vibrancy of colors you get with admech and infinity stuff is worth copying.